Sometimes, when darkness overcomes the light, a hero must rise to fight back the darkness. These Hero Bracers are a sign of a true hero, come to fight off evil kings, wicked sorcerers, and cruel bandits, as well as all of their sinister minions. 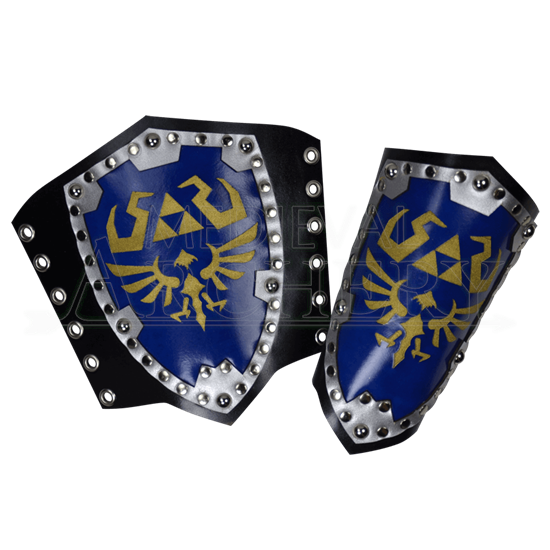 These bracers feature, as their prime emblem, the shield of a true hero, decorated with all the symbols and seals that will identify their wearer as a hero of worthy of legend. The shield emblem is shaped like a classic kite shield, possessing a silver studded edge and a blue field on the center, which is occupied by several distinctive designs. The first, near the top, is a sacred icon that consists of three gold triangles. Flanking this sacred icon are two twisted line designs, also in yellow-gold. Beneath this meaningful symbol is the crest of what could only be a royal family, featuring a bird-like design with wings outstretched. The bracer is crafted almost entirely from top quality 7/8 oz. leather, which means that they are both supple and sturdy, providing a good balance of weight, comfort, and defense. They are handcrafted and hand painted, and are made right here in the USA. They are worn using lacers along the edge of the bracer, as well as leather lacing that is tied off once the bracers are fitted around the forearm. Gamers, in particular, will love the look of these Hero Bracers, although there is nothing stopping heroes from around the world, from various LARP groups or reenactment troops, from enjoying these bracers with impressive shield-like design.